Efforts to expel Zoabi escalate after remarks justify kidnapping of three yeshiva students; AG, Ethics Committee approached for action. Culture Minister Limor Livnat (Likud) announced that she intends to turn today to the Attorney General demanding an investigation into MK Hanin Zoabi, a spokesperson for Livnat stated, and whether her remarks justifying the kidnapping of three yeshiva students can be classified as an offense under Section 144 of the Penal Code against "incitement to violence of terror." Article 144 of the Law states, inter alia, that "calls to violence or terrorism, or praise, sympathy or encouragement act of violence or terrorism, supporting [terrorism] or identifying with [terrorism]," are violations of Israeli law. Livnat called on the Attorney General to uphold the law Tuesday. "Hanin Zoabi is not fit to be a Member of the Knesset of Israel, and she must be put on trial," a spokesman for Livnat released in a statement. "While Zoabi participated alongside the Mavi Marmara flotilla with armed terrorists, she explained that this was a 'humanitarian action.' Now she says that the abduction of the boys is a legitimate action and not an act of terrorism. Bring her to justice - here and now." MKs Shimon Ohayon and Orly Levy-Abekasis (Yisrael Beytenu) have also sought legal action against Zoabi, and filed a complaint with the Knesset Ethics Committee Tuesday afternoon over her remarks. 'MK Zoabi is a shame to the Israeli Knesset," the complaint reads. "She encourages further kidnappings and acts of terror against Jews and does not deserve to sit in the Israeli Knesset." "We demand from the ethics committee to take appropriate measures in accordance with regulations of the Knesset." Earlier Tuesday, Zoabi stated to a shocked interviewer on Radio Tel Aviv that the "kidnappers are not terrorists" and that the kidnapping is a "last resort" for Palestinian Arabs frustrated by their lives. "They are not terrorists, I do not agree with you!" Zoabi fired. "They have seen no other way to change their reality and they have to resort to these measures until Israel sobers up a bit and feels the suffering of others." Zoabi hung up on interviewer Sharon Gal after the statement, leaving Gal and the audience in shock. The comments have caused a media firestorm as concern escalates over the safety of the three teenagers, who were kidnapped by Hamas terrorists Thursday night while attempted to travel home from school. A security detail has been dispatched around Zoabi's family Tuesday morning, according to IDF Radio, as angry reactions pour in from the shocked public and enraged MKs. Foreign Minister Avigdor Liberman (Yisrael Beytenu) slammed MK Hanin Zoabi in a Facebook post Tuesday, after the Israeli Arab MK justified the kidnapping of three yeshiva students by Hamas terrorists. "Not only are the kidnappers terrorists; Hanin Zoabi is a terrorist," Liberman said. He called for harsh judgement to be meted upon the MK. "The fate of the kidnappers and the fate of Zoabi, an inciter, should be the same." "Expel her to Gaza and remove her diplomatic immunity," MK Miri Regev (Likud) stated Tuesday. "This is a betrayal. She identified herself with terrorists on the Mavi Marmara and now she identifies herself with the Hamas terrorists who kidnapped our three boys." "I was not surprised to hear this," Regev added, "How can a traitor like her blame them? She does not belong to us, but to Gaza." MK Moti Yogev (Jewish Home) argued that Zoabi's statement breaks all boundaries, and vowed to work diligently to see Zoabi expelled from the Knesset permanently. "Her position on the terrorists is closer to them than to us, she should be with them instead of in the Israeli Knesset," Yogev said. 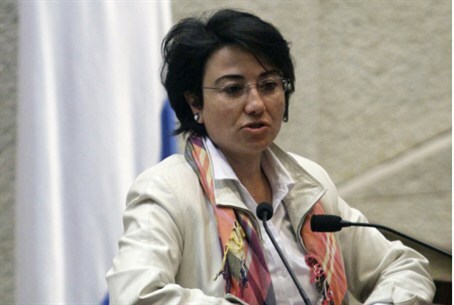 "Hanin Zoabi continues her consistent tradition: to express support for terrorists and to prove that she does not deserve to be a citizen of Israel, and certainly not a Knesset member," Housing Minister Uri Ariel (Jewish Home) added. "Zoabi is a prize for terrorism in the Knesset, a reality not found in any democratic country in the world." Zoabi is infamous for provocative speeches, including one in which she said that Israel has “no right to a normal life” and a later address claiming that “the Israeli occupation” was behind the murder of Israelis in Bulgaria. Recently, she declared that Israel should "thank her" for allowing Jews to live in the Jewish State. Before the last elections, the Central Elections Committee banned Zoabi, under a clause requiring candidates and parties not to work against Israel's character as a Jewish, democratic state. However, the Supreme Court later overturned the decision and allowed Zoabi to run - a decision Deputy Defense Minister Danny Danon lamented Tuesday. "I was able to reject [Zoabi's] candidacy for the Knesset in the [Central] Elections Committee, but the Supreme Court overturned the decision," Danon said. ''This is a fiasco which the Knesset has to stop."